Saturday may 14th 2011 after I had finished my job, I quickly did some shoppings in our local supermarket. 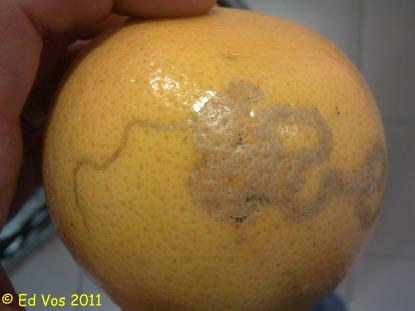 I was surpriserd to see an engraved grapefruit amongst other grapefruits that weren't engraved. I immediately made a few pictures of it with my cell-phone. Aftyerwards I was disappointed I didn'r buy that grapefruit so I could have taken pictures with better equipment and lightcircumstances, and could have examined that grapefruit thouroughly. But as a matter of fact I didn't buy it. 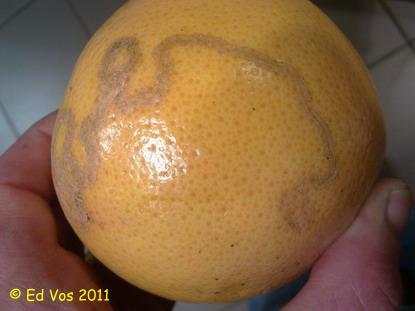 It was a red grapefruit that was grown in South Africa. 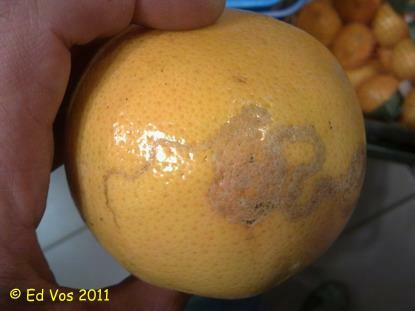 I inspected other fruits, but no other fruits were engraved.